Hm, since I don’t know how to say this in a way that doesn’t completely destroys the little that is left over of my reputation as a man with taste, but I really loved the Adam Ant records. I played them to death! King of the wild frontiers , with two drummers playing Burundi-rhythms, is still in my top100. And the songs that he did before this LP are great too, like the Decca demos and the Dirk wears white socks LP. But I must admit that the later Adam Ant records have lost their magic for me, and I am willing to consider the fact that some of the records never had much magic in the first place. Give me another ten years, maybe then I can listen to this music objectively. For me Adam Ant and Sigue Sigue Sputnik are related. That is because I once traded tapes with a guy who was a huge fan of both bands. His name is Rob K. and he had access to all kind of obscure Adam Ant demos, interviews and other audio oddities, of which he taped many for me. 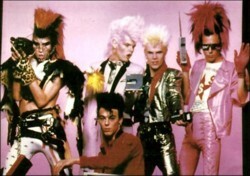 One day i heard the first Sigue Sigue Sputnik single on the radio, and i really liked it. This was Love missile F1-11 , as you all will remember. Because I knew Rob was a SSS-fan, I asked if he could tape that song for me. I got many tapes with all kind of Sigue Sigue Sputnik material, but not the version of the song that I wanted to hear. 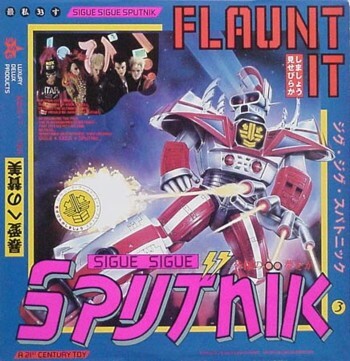 After a few Sigue Sigue Sputnik tapes I decided to but their debut LP ( Flaunt it ) myself. But to my surprise i didn’t like the LP at all and the version of Love missile F1-11 on the LP is not the same as the hit single. So I had to buy the 45 too. It is still a mystery why I like it so much. These guys can’t play, they can’t sing, the song is a joke and the rest of the songs on Flaunt it are crap. And Dress to excess , their second album, which I bought too, proves that what I am saying here is true. Alan Vega had done this trick earlier, and much better. After watching all the Sigue Sigue Sputnik videos on YouTube, I began to understand the concept. 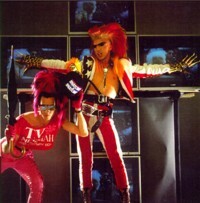 Sigue Sigue Sputnik is a science fiction precursor of Madonna. It is not about music, but about an image, an idea. And these guys really were way ahead of their time. In the eighties they made a parody of something that was yet to be created! 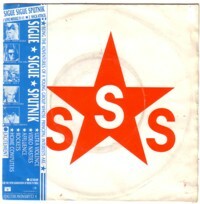 Sigue Sigue Sputnik is usually filed under one-hit-wonders, but they have produced at least six LP’s. And they are still touring! And based on what I saw and heard, everyting is very much the same: these guys still can’t play, they can’t sing and their songs are crap. But they got a great act! Here is the single version of Love missile F1-11. Thanks, I’ve been looking for that version on soulseek, but to no avail. I bought it when it came, but I don’t know where it is. Or maybe I shoplifted it, I had bad habits back then. I still like this particular song but mostly I’ve been very disappointed when I’ve refreshed my memory about SSS.